Rockridge's new meat-focused pan-Latin restaurant is hampered by high prices and poor execution. The grilled rib-eye steak was flavorful but pricey considering the small portion. Hours: Daily 5-10 p.m., Mon.-Fri. 11 a.m.-2:30 p.m., Sat.-Sun. 10 a.m.-3 p.m. Bourbon & Beef, a shiny new restaurant in Rockridge, follows a tradition of Bay Area eating-and-drinking institutions with alliterative, often ampersanded, "B" names — Baker & Banker, Bakesale Betty, Bosco's Bones & Brew — that range from the wholly esoteric (Box & Bells) to the pleasantly inoffensive (Blackberry Bistro). And if part of the tradition is for such a name to keep the restaurant's actual concept shrouded in mystery, well, Bourbon & Beef fits right in. It isn't really a steakhouse, as its name might imply, and it definitely isn't a Southern-style barbecue joint, which would also make sense. Fusion-y Latin-American small plates, which is what Bourbon & Beef actually serves, would be pretty far down on the list. The short explanation, according to chef-owner Munther Massarweh, is that one of Massarweh's business partners really likes bourbon and insisted that they include it in the name. But in the end, the chef's personal background, as an ethnic Jordanian who was born in El Salvador but grew up in San Francisco, is what left the biggest imprint on the restaurant's concept — fifty-some bourbons available by the glass notwithstanding. Particularly, it's the flavors Massarweh encountered during the time he spent in Central and South America that stand front and center. Still, the restaurant lacks a clear identity. From the bright recessed lighting and festive red-and-lime-green color scheme to the clubby Latin soundtrack and the bartending bros in tight black T-shirts, the place looks and feels more like a Miami hotel bar than it does your typical Oakland reclaimed-wood backdrop. Is it a tapas joint? A cocktail lounge? 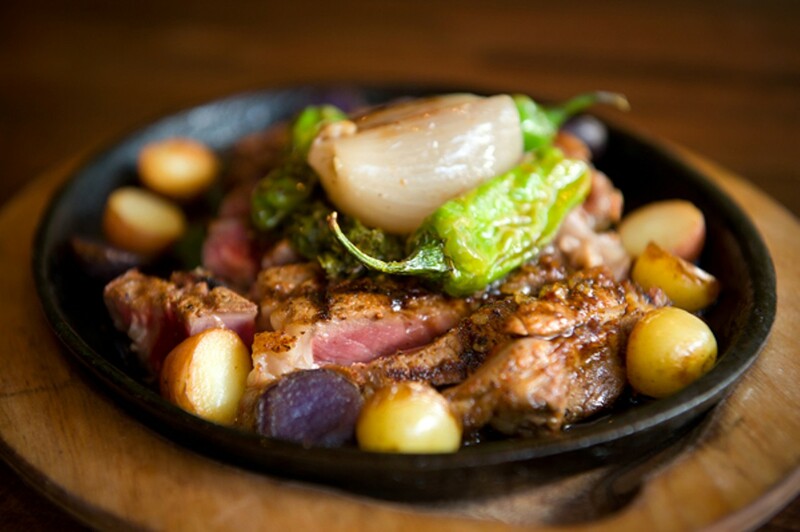 A place for steak-and-potatoes lovers? Bourbon & Beef tries to juggle all of these elements and can't quite pull any of them off convincingly. But ultimately, the restaurant's fatal flaw is much more basic: The cooking execution is far too inconsistent to justify some of the highest prices you'll find in the East Bay. 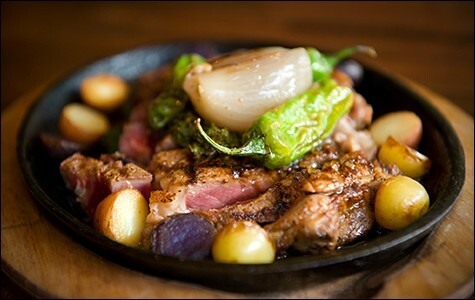 Massarweh said that even if the restaurant isn't strictly a steakhouse, it does focus on beef, and it's true that about a third of the dishes on the dinner menu have some beef component. That said, the $19 carne asada was a bad sign: Ancho-marinated sirloin steak was gray all the way through, tough enough to give our jaws a workout, and covered in enough tangy slaw and spicy guajillo chile sauce to mask whatever actual beef flavor there may have been. A pile of better-than-average French fries, seasoned with smoked salt, was the only appealing thing on the plate. Forget for a moment the acceptability of charging $19 for a "small plate" (it's not acceptable); a dish executed this poorly is an embarrassment for a restaurant with the word "beef" in its name. The carne de res — a grilled boneless rib-eye steak — was a little better. The steak was well charred and flavorful, topped with a vinegary chimichurri that complemented the meat nicely. About half of the rib-eye was cooked medium-rare as requested, but, because the steak was cut unevenly, it had a thinner end that was cooked all the way through. And for a dish meant to serve as a shareable entrée, the sides seemed awfully ungenerous — just a handful of baby potatoes and about three small roasted shishito peppers. Even in well-to-do Rockridge, it's hard not to feel sticker shock when you're charged $36 for maybe eight ounces of ho-hum meat. We fared better when we avoided the beef entirely and treated the restaurant as more of a Latin-American tapas bar. My favorite dish was the puerco con curtido, which consisted of three mini pork-belly tacos, made with cubes of well-marbled Kurobuta pork belly that were deep-fried (yielding a crisp outer shell and tender, juicy flesh) and served atop cool jicama slaw (the "curtido") and good corn tortillas. The pescaditos empanizados were three cilantro-crusted smelt (breaded and fried, like fancy fish sticks) served over bright-red tomato slices and chimichurri — a simple but tasty combination. No snark: Double the portion and put this on sliced bread or a po'boy roll, and it would make for a helluva fish-stick sandwich. Massarweh's signature dish is his paella, a non-traditional version topped with an array of seafood (a few rather muddy-tasting crawfish, two giant Tasmanian shrimp, and several small-meated mussels), chicken, peas, and some thick slices of garlic. The rice itself was spiked with spicy Mexican chorizo, but it lacked the crunchy caramelized crust (or socarrat) that is the best part of traditional paella. It was tasty enough, although a yogurt sauce, like what you'd spoon over a Middle Eastern kebab, confused my taste buds. There's room in Oakland's dining scene for a restaurant like this — say, a loungier, more dressed-up, fusion-y version of César or Bocanova. But not at a price point that rivals some of the most expensive restaurants in the East Bay. After all, when you serve $14 small plates and $30 entrées, customers should hold you to a more exacting standard. Portion sizes will be scrutinized. Tough, overcooked steak isn't going to cut it. And while I normally have little use for such fine-dining niceties as swapping out the dishware between courses, if you're going to charge $30 for paella, I would, in fact, like to enjoy it on a plate that isn't streaked with the sauce remnants of two or three earlier dishes. If you'd like to give Bourbon & Beef a try, lunchtime is the most cost-effective time to do so, especially since the restaurant launched a new lunch menu with sandwiches priced around $13 and a fairly extensive selection of taquitos for $4 to $6. It's not budget dining by any stretch, but that crispy pork belly does make for a fine taco, and the pescaditos taco should bring my dream of the perfect fish-stick sandwich one step closer to reality. Do not, out of courtesy to the restaurant's name, feel compelled to order the beef. But a shot of bourbon? You can't go wrong with that.